Even before the United States formally declared itself a nation, it resonated and inhered exceptional national characteristics: liberty; individualism; capitalism; opportunity; productivity; strong institutions; stability. This instantaneous greatness bespoke a founding ethos, something concrete, not something haphazardly evolved. It is the “something” that makes America unique, so capable and workable. The guiding ethos upon which the Founders and Colonialists based their lives and society was the Judeo-Christian ethic. Those wishing to deny the foundational and continued importance of the Judeo-Christian ethic credit alternative reasons for America’s out-of-the-gate greatness. They point to our abundant resources, vast lands, and situation between two oceans. However, all of the above conditions can be found in other places around the globe, not to mention how America was already great before its expansion westward. Equally off mark is the assertion that distance from war has allowed us to blossom unhampered within. The ten major wars which have occupied the U.S. in but 230 years debunk this theory. No, the uniqueness and stability which is America lies necessarily in a protean philosophy precipitant to such a model and outcome, i.e., a wellspring precisely suited to deliver those national aspects by which America is known and which provides its success. It is an ethos found nowhere else. Though sourced in religion and Scripture, the importance for society of Judeo-Christianity lay in its spawning of cultural norms, so that already by the time of Benjamin Franklin’s writings, the Calvinist religious ideals of frugality, hard work, and thrift were conspicuous societal attributes, even among those not attending services. Indeed, capitalism as the overriding American commercial mode, as Max Weber points out in The Protestant Ethic and the Spirit of Capitalism, derived from the Calvinist belief that work and devotion to rational conduct is a spiritual vocation. We know this as the Protestant Work Ethic. The importance of apprehending the less doctrinaire but religious outlines of Judeo-Christianity lies in the fact that religious motifs determine a country’s cultural values, with culture influencing politics — the country’s destiny and way of life. A major shift in religious beliefs leads ultimately to a shift in cultural and, thus, political outcomes. What do we mean, then, when we speak of the Judeo-Christian ethic, and why is it found only in America and not in Christian Europe or Jewish Israel? Judeo-Christianity, as practiced and understood by the Pilgrims and Puritans in America, placed special emphasis on the Old Testament, its laws, role models, and themes. It was a Calvinist/Protestant reading of the Old Testament. This was a departure from fifteen centuries of Christianity that had shoved aside the Old Testament to almost peripheral status — treating it, at best, as a service road to the New Testament, not, however, as a free-standing guide in itself. European Catholicism never made the Old Testament a centerpiece, nor did even Luther’s Reformation in Germany. No where else is the concept of liberty heralded as in the Old Testament: “Proclaim Liberty throughout the Land” (Leviticus). Individualism, i.e., the individual as an auto-responsible agent derives from having been “Created in the Image of God” (Genesis). One’s absolution from collective/group guilt is underscored by “Each human by his own sin is to be judged”(Deuteronomy), and “Do not punish children for the sins of their fathers” (Deuteronomy). Rights inhere in the individual, not the group or tribe. The Judeo-Christian ethic taught that there is a singular, objective set of laws and standards that are applied evenly and across-the-board to all. Equal Justice for All: “And when you judge, you shall do so not according to who is bigger or smaller” (Deuteronomy and Leviticus). This in contrast to on-going revolutionary European Marxism and French Jacobinism that sees fairness and justice only in that which advances the “aggrieved classes” in its pursuit to topple the established class. Until recently, American “Fair Play” meant not allowing political motivation to overturn the rules of the game covering all. Man’s duty to cultivate initiative, ingenuity, and find solutions — not to be fatalistic — is not only because he is created in the image of God but because Genesis mandates that human ” Harness, subdue, and orchestrate the Garden ( Nature )” so as to improve his condition, and find healing. What is more American than the notion of ingenuity and can-do-ism. Contrary to fashionable multicultural assumptions, these themes are not found in most other religions and holy books. In fact, some are exclusive to Judeo-Christianity, while others are decidedly more pronounced and emblematic therein. No doubt, the epic outpouring of kindness from churches in Houston and the monumental generosity of church goers to hurricane Katrina’s victims is one such example. Personal initiative prevailed–a bedrock Judeo-Christian religious theme– not Karma nor fate nor resignation. “Love Thy Neighbor as Thyself ” impelled thousands, in that quintessential American way, to take responsibility and not wait for government. Two other uniquely American characteristics that derive from a faithful reading of the Old Testament are (1) Local control and (2) Moral clarity as to right vs. wrong. From the Mayflower Compact through the proliferation of autonomous communities into Massachusetts, Rhode Island, Pennsylvania and Virginia, was a rejection of grand statism in favor of local control: “And each city shall set for itself officers, judges, and laws” (Deuteronomy). Again, “The poor of your community is your responsibility, first” (Deuteronomy). Unlike medieval Catholic Europe that saw salvation through an institution, the Church — and later the State, Calvinistic Protestantism declared the individual’s personal conduct and belief as the sole road to paradise — acculturating, later, in the American ethos of individual responsibility for one’s own conduct, actions and success. Because of a no nonsense reading of the text, early American Protestantism beheld things and life as did the Old Testament: that which is right, that which is wrong. Some refer to Judeo-Christian rejection of relativism as a form of absolutism. The fact is,it has lead to our strong national character and moral clarity. 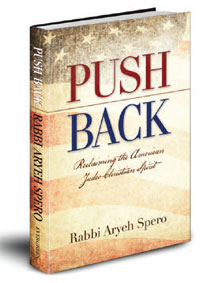 No nation has been guided by a more consistent devotion to moral clarity than the United States — not even ancient Judea. “Be forthright in your Talk”(Deuteronomy), and “Remove yourself from speaking falsehood” (Exodus). Our straight talking John Wayne/ Gary Cooperism is indicative of religious ideals morphing into cultural norms. It is not so in all cultures, where sly and misleading rhetoric is routine given their holy book’s earlier countenance of lying if in behalf of the faith’s cause. Though a Jewish State, Israel is not guided by the Old Testament in the same fashion as were the Founding Protestants here. Centuries of rabbinic add-ons, far reaching Talmudic interpretations, two centuries of post Enlightenment Jewish sociology — and ongoing flirtation with socialism— have led to a cultural/academic outlook less inclined to be bound by a simple, strict reading of the Five Books’ text. In other words, it is Jewishness more than Biblicalism. The discomfort of being guided by a simple reading of the Old Testament text has fashioned a Jewish State — though democratic, energetic, and highly creative — with an ethos quite different than America’s. Until recently it was understood that while every citizen is free to worship as he wishes, observe his ethnic and religious traditions, associate in like-minded clubs, and enrich our society by imparting into our culture the better aspects of his background, the glue that held us together and gave us identity was our common culture called Americanism, the unique American civilization, based on the Judeo-Christian ethic. We called it the Melting Pot. Undoubtedly, while other cultures offer and contain significant and worthwhile attributes, the American culture excels, is indeed superior, in ensuring: liberty, fair play, individualism, capitalism, equal justice, initiative, personal growth, national strength and stability, enduring institutions and benign order. This is not an accident of history. To the extent we erode the Judeo-Christian ethos we mitigate our greatness, imperil our safety, diminish our chances of continued success, and jeopardize our way of life. Not even with the arrival of millions of Chinese, Vietnamese, Hispanics and Indians has our legal system been asked to change, none have clamored for an America governed by Chinese or Indian law. But now for the first time in our history, there are elements within a newly arrived immigrant group speaking among themselves and clamoring at certain public rallies about a future America living under not American law but Islamic law, shariah law. Their apologists on the Left have begun speaking about our Judeo-Christian-Islamic heritage. This is a canard of the first order. Many of us yet alive still know (we are too old to be brainwashed by the multiculturalists) that Washington, Jefferson, Adams, Lincoln, T.R., Truman and Reagan were not followers of Islam , nor was the Koran used as a guide at the Constitutional Convention — not even as late as the 2000 Democrat Convention. As mentioned, our American ethos — that which for over 300 years has made us successful and who we are — is the unique matrix found only in the Judeo-Christian ethos. Our laws, habits, ideals, principles, and role models result from it. Though we tolerate all religions, as well as peaceful, non-inciting, religious worship, all religions are not the same and they produce far different value systems and cultural norms. No better evidentiary proof exists as to the difference between a society built on Judeo-Christian principles as opposed to that built on Islamic attitudes, shariah law and Koran than that of the United States vs. Saudi Arabia. Only a multiculturalist would assert that all religions are the same. Not only are they not, but each produces a totally different state, so that even those living a secular life are not spared the far reaching effects of a nation guided by a different Holy Book. Unfortunately, there are legions of multiculturalists and enforcers of political-correctness who loathe the Judeo- Christian ethos (especially Fundamentalist Christianity) and are already partnering with the cultural jihadists to topple historic America. The ACLU comes to mind. Assuredly, our freedoms will erode and our way of life dissipate in proportion to our caving in to demands that allow shariah law and its habits into our system. It is up to us not to let it happen.